Shepherd’s Prayer Ministry Team is committed to actively encourage and promote prayer in the life of the church. let your requests be known to God. Our prayer teams are made up of individuals who hold your prayer concerns confidential and are honored to pray for you. Our prayer teams are available during the 9 am and 11 am services every Sunday. Your Prayer and Praise requests listed on the “In Touch” card are e-mailed to members of the Prayer Chain. 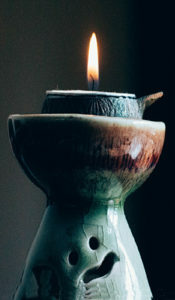 Centering Prayer is a method of silent prayer that prepares us to receive the gift of contemplative prayer, prayer in which we experience God’s presence within us, closer than breathing, closer than thinking, closer than consciousness itself. This method of prayer is both a relationship with God and a discipline to foster that relationship. The method is easy to understand. For information or if you have questions about the Centering Practice, please feel free to contact Jill Yamada at jyamada@sothumc.org. The Prayer Shawl Ministry is a way to send God”s love and our prayers to someone who is hurting. Each shawl is prayed over as it is being made. Shawls are then prayed over by members of our congregation. On communion Sundays the shawls are placed on the altar where everyone is invited to offer a prayer for each shawl and its recipient. Our Prayer Shawl Table is set up on the patio on Sundays. Shawls can be requested there by filling out a request form. There is no charge for a shawl although donations are always welcomed to pay for labels, prayer cards and bags. We offer knitting and crocheting classes every so often at both campus sites for people who would like to participate in this ministry. Our knitting group, The Shepherd Knit Wits, meets on a regular basis to knit and enjoy fellowship and friendship. It is so rewarding to know you have touched someone’s life with a shawl containing the greatest gift of all, prayer. If you are interested in joining this ministry contact Marilyn Widen (Mission Viejo Campus) at widenmad@yahoo.com. Silent Saturday is a day of quiet meditation and prayer, held twice a year at the MV campus (Lenten Silent Saturday and Advent Silent Saturday). The entire MV campus is used for the event. Rooms and all outdoor areas around the church campus were available for you to breathe in the Living Spirit of God for journaling, walking a labyrinth, viewing a video presentation or to just “be” in the presence. The prayer room, prayer garden or even a swing in the play-yard is yours to enjoy. Lenten Silent Saturday will be April 6, 2019. Information and registration is here. 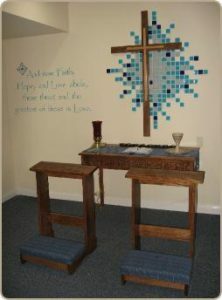 A sacred space on the Mission Viejo campus where one can reflect and pray day or night. Members are presented a key when they join the church. If you have lost your key, please visit the church office table on the patio Sunday mornings. The Easter Prayer vigil on the MV campus starts at 9 pm on Good Friday and concludes after 33 hours on Easter morning. For questions or more information about the Prayer Ministry, please contact Diana Annett, Prayer Ministry Coordinator, at annett1@cox.net.